Fibro-epithelial polyps are described as a growth of the soft tissues, with pedunculated base. They are infrequent in children. Fibrous lesions are relatively common. They are mainly found in the tongue, cheeks palate and gums. They are normally caused by a chronic, mechanic irritation or inflammation. 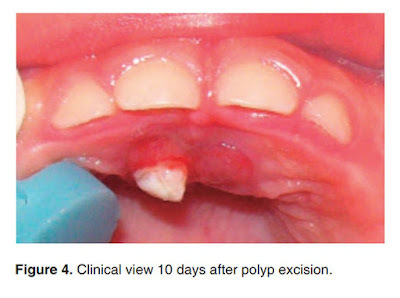 In children, most intra-oral fibrous lesions are reported as epulis. While fibrous lesions are common in the mouth, palatal polyps are rare in children.3 In 1999, Tornizawa et al reported three cases of palatal polyps in children. These cases were diagnosed as fibro-epithelial hyperplasia; they also presented impacted supernumerary teeth. Nevertheless, the histopathological study did not reveal any trace of odontogenic tissue; therefore, histological relationship between hyperplasia and supernumerary tooth could not be confirmed. Location of supernumerary teeth can be found in all sites of the dental arch, with predilection for the pre-maxillary area. Mesiodens would be the most common, located in the upper central incisor region. Many theories have been described with respect to their etiology; among them we can mention dental lamina hyperactivity influenced by a genetic pattern. We must also consider alterations sustained during epithelium and mesenchyme interaction and affect tooth development. Nevertheless, this situation is less likely in primary dentition due to the environmental balance before birth. Most mesiodens do not erupt, and when they do, the most common location is in the pre-maxillary area, next to the central incisor.